Whether you grow red clover as a ground cover or as a pasture for animal feed, red clover grows easily, especially in northern regions. Red clover will not only feed or attract a variety of animals, but it also enhances the nitrogen content in the soil, which makes it valuable for planting with other plants. Plant red clover in the spring by broadcasting it evenly over the planting area. 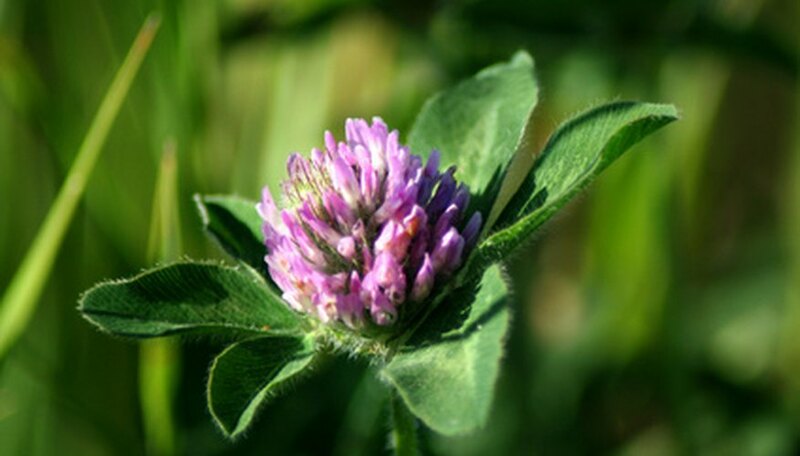 The red clover will grow quickly to produce at least two harvests during the growing season. Prepare the soil prior to planting the red clover in the spring. Use the garden rake to roughen the surface of the soil to ensure that the red clover seeds all have adequate contact with the soil. Place the red clover seeds into the broadcast spreader. Add an equal amount of organic granular fertilizer to the broadcast spreader. Mix the fertilizer and red clover seeds. Adding the fertilizer at planting time serves to make it easier to broadcast the small clover seeds and helps to get the red clover seeds started with a boost of fertilizer. Apply the clover seeds and the granular fertilizer to the soil, planting between two and eight oz. of red clover seeds to every 1,000 square feet of planting area. Reduce or increase the planting amount according to the size of your planting area. Broadcast the seeds as evenly as possible. Rake the soil again lightly to cover the seeds with ¼-inch of soil. Water the planting area lightly but thoroughly with the garden hose to moisten the soil evenly. Provide a thorough watering every morning and every evening until the red clover seeds germinate. Irrigate red clover only during periods of drought and only provide enough water to saturate the soil evenly. Harvest red clover for the first time before it blooms completely by cutting it back to a height of approximately three inches. Harvest red clover a second time in early August before it blooms again. Red clover planted alone generally provides only two harvests during the first year of growth. You may wish to mix red clover seeds with grass seeds for planting. Mix eight lbs. of red clover seeds with 10 lbs. of tall fescue (adjust amounts for a smaller planting area, if necessary).